In just just over 5 short months, my sweet Liliana will be heading to Pre-K. Due to her late summer birthday, she will be the youngest in her class. Socially and emotionally, she's ready. I am concerned about her falling behind academically. Right now, I'm really focusing on helping her master the basics: Number and Letter recognition, spelling and writing her name, counting, and learning a few short sight words. Teaching Lily is proving to be a much different process than it was with Dylan and Lexie. The biggest challenge is lack of time. I have 3 other children, many appointments and activities, and a house to take care of. I simply don't have as much time to devote to just her. Plus, she isn't fond of sitting down and using worksheets and workbooks. She needs to be challenged with fun learning activities! Dylan learned quickly because he was our one and only, and had all of our attention. Lexie was born 2 years after Dylan, and learned the basics even faster, because she was learning alongside Dylan. Lily came along 4 1/2 years after Lexie, and that age gap put them on much different academic levels! Lily will easily tell us 3+3 is 6 and 5x5 is 25, after hearing her siblings memorize addition and multiplication facts, but she still struggles with some number recognition. Last week, I bought some Easter supplies and some necessities. 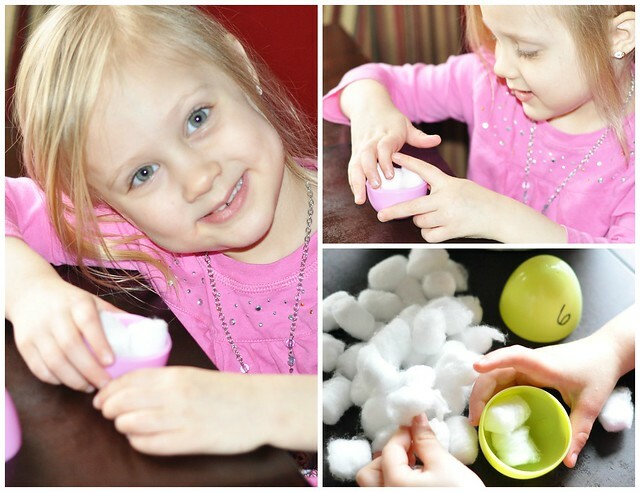 As I was unpacking a bag, I saw the cotton balls and large Easter Eggs side by side, and an idea formed. 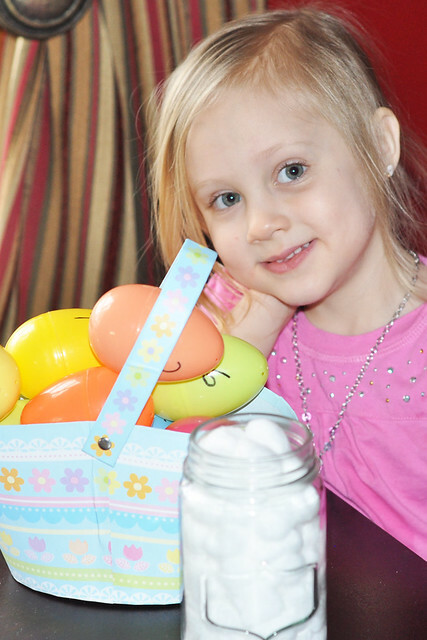 Lily LOVES playing with Easter Eggs. She opens them, fills them, and empties them over and over again! Why not use them for learning?!? My idea focuses on number recognition, counting, and fine motor skills. My idea was so simple, but Lily loved the concept! I chose the numbers 1-10, and I wrote a large number on each of the 10 plastic Easter Eggs using a sharpie. 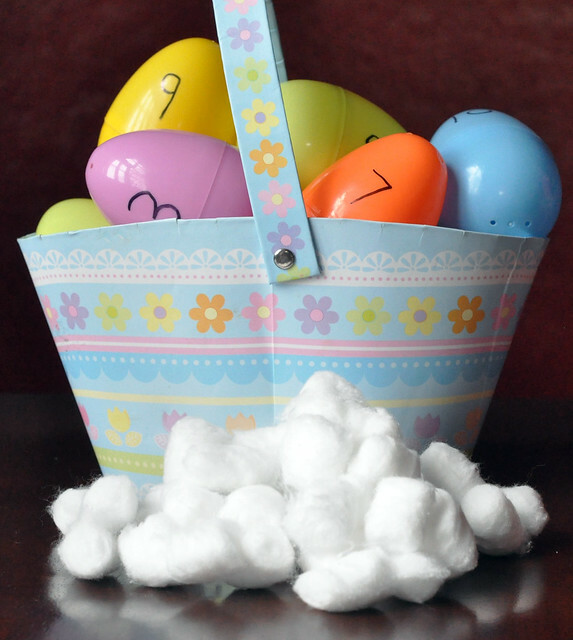 I put the eggs in a basket, and dumped the cotton balls on the table. I told Lily to pull an egg out of the basket, identify the number, then count out the same number of cotton balls and fill the egg with them. 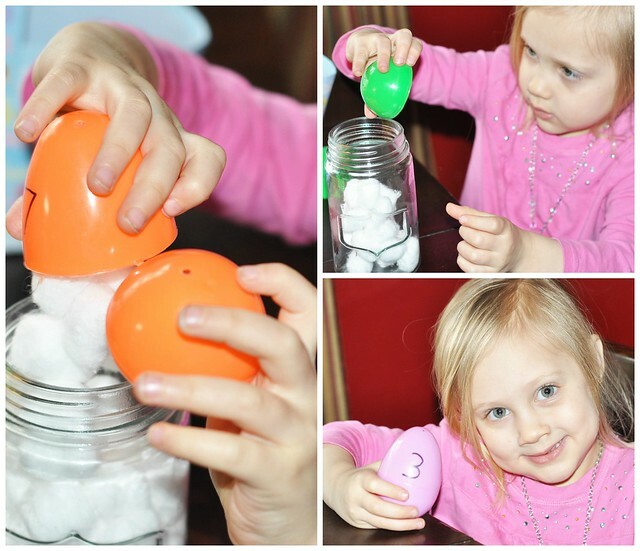 Once the egg was filled with the correct number of cotton balls, she could close the egg, put it aside, and move on to the next one! She had so much fun, and I was surprised by how much she already knew. After a few more rounds, I'm going to add the numbers 11-20! 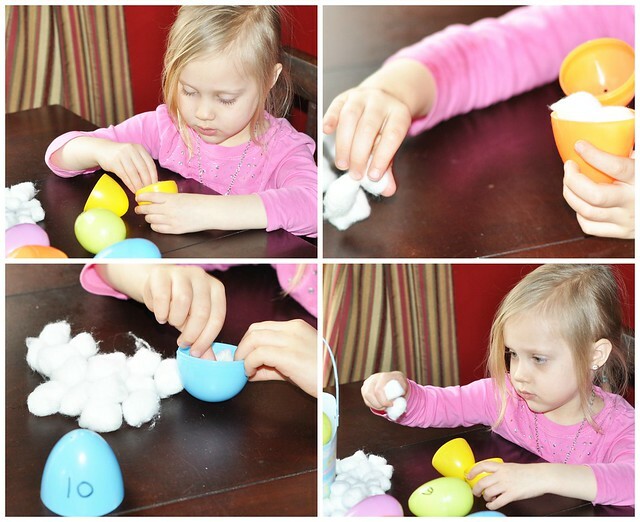 After she was done with all the eggs, she could open them, dump the cotton balls back into the container, and place the eggs back in the basket. I think she had just as much fun cleaning up! She decided to keep out the number 3 egg, because it is, after all, how old she is! Although this is definitely an Easter themed activity, I'm going to keep it out for while. She really enjoyed it and already asked to play several more times! I'm so glad she enjoyed this activity! The supplies were really inexpensive, it took less than 1 minute of preparation, and everything can be stored away easily until the next time she wants to play. Success! Such a cute idea! And yes, time when it is the younger kids can definitely be challenging at times. Definitely will be doing this with Ryder. Hey, you should add this post to my best of the blogosphere link up from Monday, this post would be perfect! Thank you! I just added it! This is cute and is actually A LOT of different math concepts all in one! I've done a matching capital and lowercase letters with Easter eggs too. This is an awesome project! I think I might have to use it for my class. I'm impressed mama! I think Coop would LOVE this! Thanks! It's an easy one! Thank you! It was such an easy activity!